I am living proof of God’s power at work within me. I should be dead by now, but God has gone beyond my wildest dreams and caused me to be very much alive! It is my desire that you come to know this amazing God, who is BIG and does BIG things. May He come alive to you on the pages of this blog, and may you come to know Him in a real and personal way in your own life. God has done BIG things in my life. I would love to share my testimony of His glorious works with you. Check out my FULL STORY in the links below. 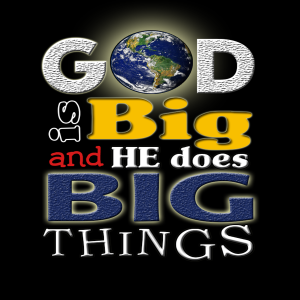 God IS big, and He DOES DO big things! To Him be the glory.